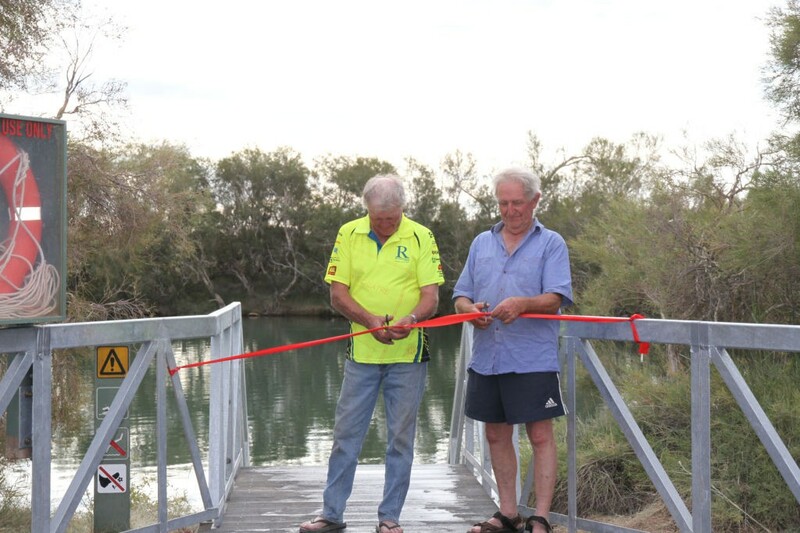 To ease the difficulty of visitors travelling in the remote regions of the national parks and conservation areas. 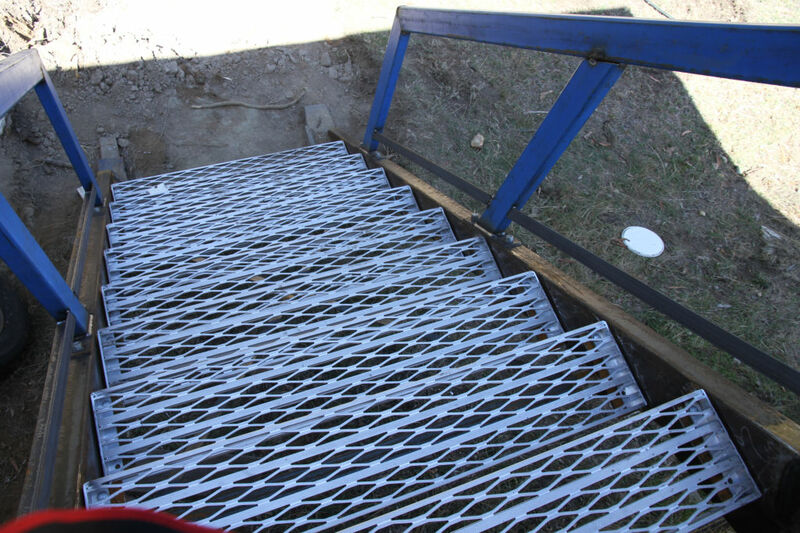 The replacement of access steps into the Dalhousie Spring. Repaint the information shelter located by the Dalhousie Spring. Replacement of star droppers within the camping ground with recycled plastic bollards. Paint the recycled plastic bollards. Maintenance to the watering system at the Dalhousie campgrounds and at Three O’clock Creek. Produce an up-to-date plan of all watering taps and their flows. Cutting back foliage at the Dalhousie campground and Dalhousie Ruins. Fence maintenance at Purni Bore. 21 members travelled from the Australian Capital Territory, New South Wales and South Australia to assist with this year’s projects. Bill and Heather Dwyer, Des and Flora Bain, David and Margaret Moseley, Dean and Shirley Moseley, Ralph Ohlmeyer, Dean Ridley, Mike and Susette Shelley, Keith and Heather Aubrey, June McKendry, Margaret Clayton, John and Raylee Harvey, Kevin Frawley, Russell and Shayne Llewellyn. As the Working Bee Coordinator I would like to take this opportunity to thank everyone who attended the 2015 Working Bee for their support, understanding and willingness to assist with each and every project. The way new members and old communicated with each other, the rangers and forged new friendships and formed a cohesive pleasurable working environment was a credit to all involved. Each and every one of us should be proud of their individual and collective efforts and can look back with pride on this year’s achievement which has improved the safety and pleasure of the travelling public and the environment within the Witjira National Park. I also would like to acknowledge the FOS committee for their support in funding our safety equipment and the 600 litres of diesel which was transported to Witjira by DEWNR and equated to 50 litres per vehicle to assist in the enormous amount of kilometres travelled by individuals just to get to the working site. Without this, and the support of our members, we could not have achieved these very positive outcomes for the enjoyment and safety of the travelling public. FOS members could not have achieved the positive outcomes without the support of the DEWNR staff at Pt. Augusta and the dedicated rangers who attended and assisted throughout the 2015 Working Bee – Senior Ranger Frank Lyman, Chris Parsons and Amanda Dudgeon. Vehicles attending also received Caltex fuel vouchers to assist with their travel expenses from DEWNR. It was fantastic to see the interaction between FOS members and DEWNR and we look forward to working together in the future. At the conclusion of the 2014 working bee in late August, whilst enjoying a relaxing dip in the 34-36C waters of the Dalhousie Spring, there was a discussion about the poor condition and public safety issues regarding the entry steps, and the possibility of FOS utilising the skill and expertise of David Moseley and other FOS members in designing, construction and installing replacement steps into the Spring. On return to Adelaide a design process was initiated by the Moseley brothers and Bill Dwyer, in conjunction with the management of DEWNR Pt Augusta and the Co-Management Board of the Witjira National Park, it was soon realised this project would constitute the largest project ever undertaken be FOS members. The design would need to be of a modular construction and a cantilever design so that no piece of the steel frame would touch the bottom of the Spring to meet the Co-Management Board’s requirements or be too large or heavy for the FOS members to manage in the installation process. After several design modification and discussions with the designer, a final design was agreed to and a budget established and approved. The steps were to be constructed in Adelaide and then dismantled and transported to Witjira by the DEWNR truck. The steel arrived at David Moseley’s Hahndorf property in early March and the task of cutting and welding began in earnest as the Moseley’s were aware the working bee was scheduled for the last 2 weeks of May; only 10 weeks away. The 28 square metres of decking posed an issue, should it be hardwood or a recycle plastic composite product. The need to minimise maintenance after installation meant the recycle decking was the best choice. Advance Plastic Recycling of Kilburn met the requirements and produced decking to the exact size required, which in turn reduced wastage. The treads leading into the spring also needed to be resistant to the strong minerals and the heat of the spring water. After many phone calls and several visits to paint manufacturers paint was acquired to coat the aluminium treads in safety white. To extend the longevity of the steel components everything needed to be hot dipped galvanised which required the steps to be dismantled and transported the Kilburn. 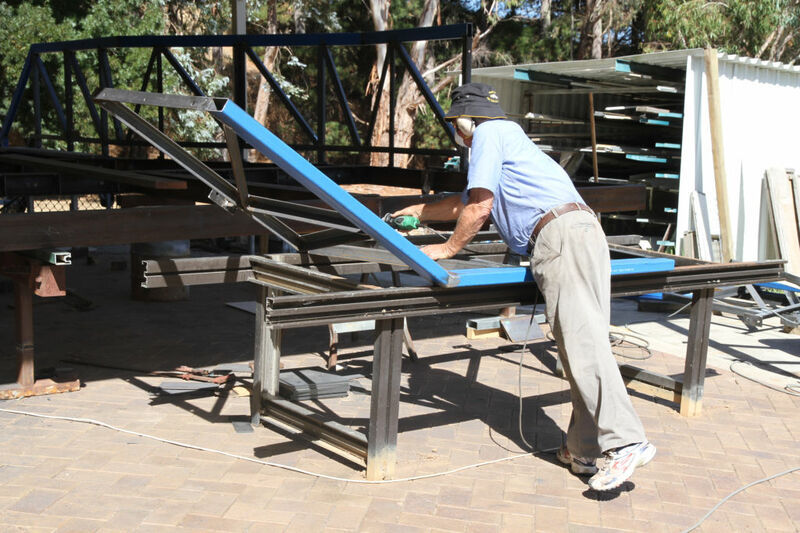 Upon completion they were returned to Hahndorf, reassembled to cut and install the timber decking support bearers. 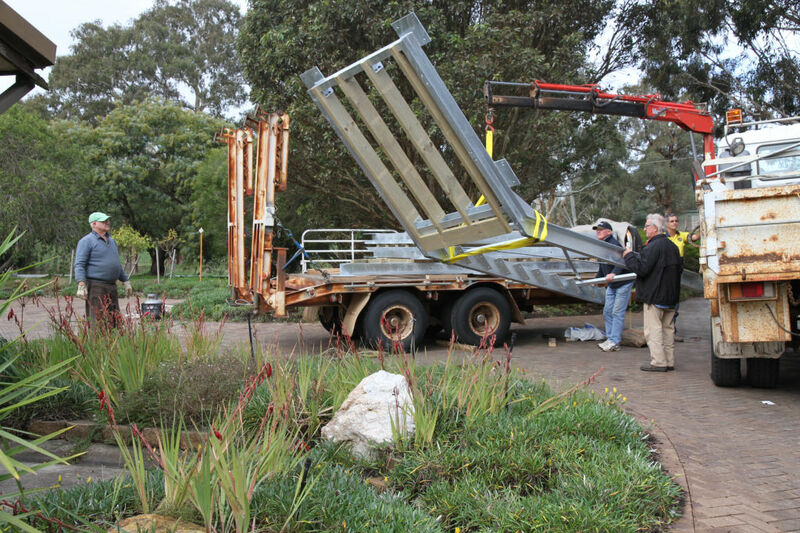 On Tuesday May 12th, Frank Lyman arrived with the DEWNR truck and float at Hahndorf to transport steps and foundation components to Witjira by the end of the week ready for the arrival of FOS volunteers. On Monday 18th of May, the first day of the Working Bee was an Occupational Health and Safety induction and a briefing on access to the workshop areas carried out by Chris Parsons. Safe working practises were adopted throughout the working bee by all FOS members and no injuries or near misses were reported. The priority on the first day was to remove the old steps and install a temporary ladder to allow the public access to the spring whilst the FOS members install the new steps. By mid afternoon access to the Spring was restored for the public and levelling of the ground where the new steps were to be installed completed. The design required footings to be dug to support the weight of the steps and on day two, members hand dug and placed reinforcing rods into the footing ready for concreting. Prior to concreting the foundation, the first section of the steps leading into the spring needed to be in place over the footing. As each modular section was bolted together the steps grew and so did the interest of the many travelling public who watched the construction. With foundations poured and the remaining sections of the steps bolted together with all handrails fitted, we now needed 48 hours to allow the concrete to set. 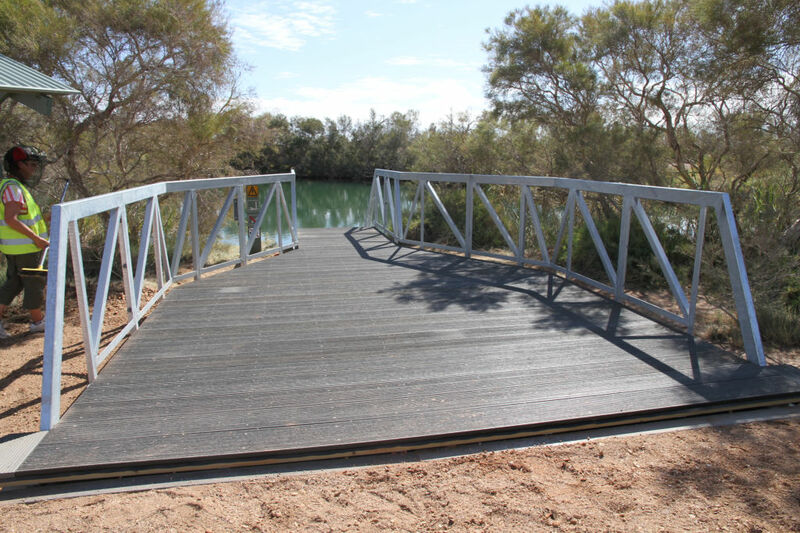 One of the last major jobs to complete the steps was the installation of the recycle plastic decking, with nearly 28 square metres to cover, FOS members drilled and screwed over 800 stainless steel screws to secure the deck into place. With wet weather forecast for the Northern region of South Australia on Thursday night and throughout the coming weekend, plus the attendance of the Witjira Co Management Board and the Official opening of the steps cancelled, it only seemed appropriate that members of FOS should unofficially open the steps and decking to the public. Allowing for the approximately 400 hours of work carried out prior to the steps arriving at Dalhousie by the Moseley brothers, the honour of cutting the red ribbon was given to David and Dean Moseley. In addition to completing the steps and decking, the last task was to realign the ground area surrounding the steps to allow for rain water to flow past the structure on either side and into the spring. 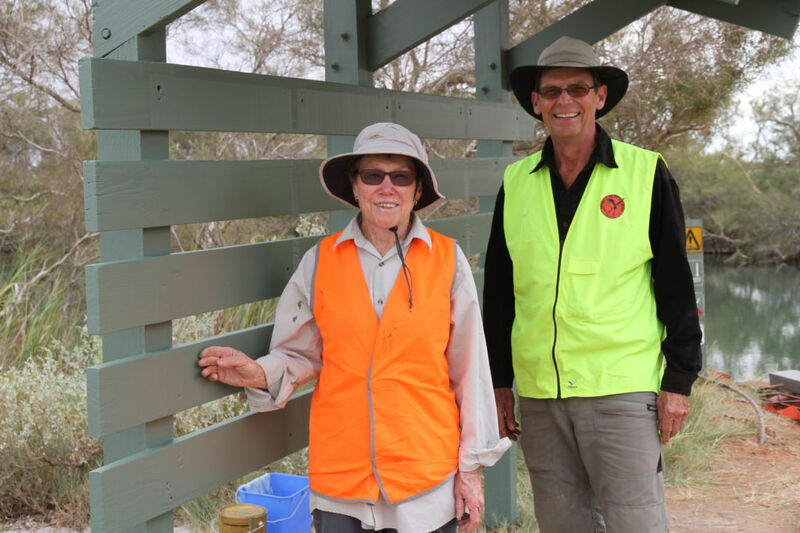 Seeing the steps completed and opened to the public was a fantastic outcome for all the many hundreds of hours of hard work and effort provided by the volunteer members of the Friends of the Simpson Desert. The reason behind the repainting of the information shelter was that with the installation of the new steps the shelter would detract from the steps in their current state. Members removed the information signs and sanded down and where necessary filled cracks. So as not to interfere with the work being carried out on the steps it was decided to start painting at 7 am before work commenced on the steps and the possibility of dust and sand being generated and affecting the paintwork. The task of painting over 80 recycled plastic bollards prior to their installation saw makeshift paintwork established in the carport of the kitchen area in an attempt to reduce the dust and dirt coming in contact with the paint and brushes. With holes dug, the first stage of replacement of star droppers within the camping ground with recycled plastic bollards was undertaken. 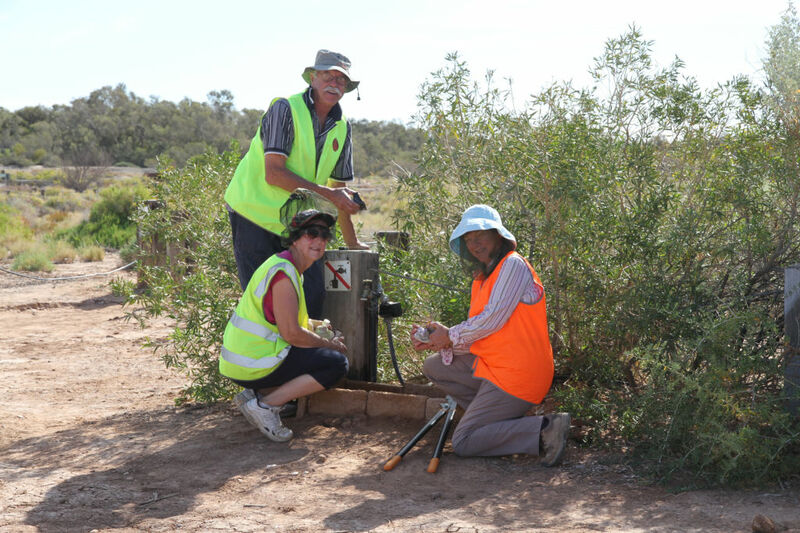 An extremely important project is the ongoing maintenance of the watering system to the many hundreds of native plants and trees planted by FOS members over the years and the pruning back of excess foliage. This year a comprehensive plan and water flow assessment was undertaken to ensure adequate water reaches all drip lines currently installed and those which will be installed in the future. 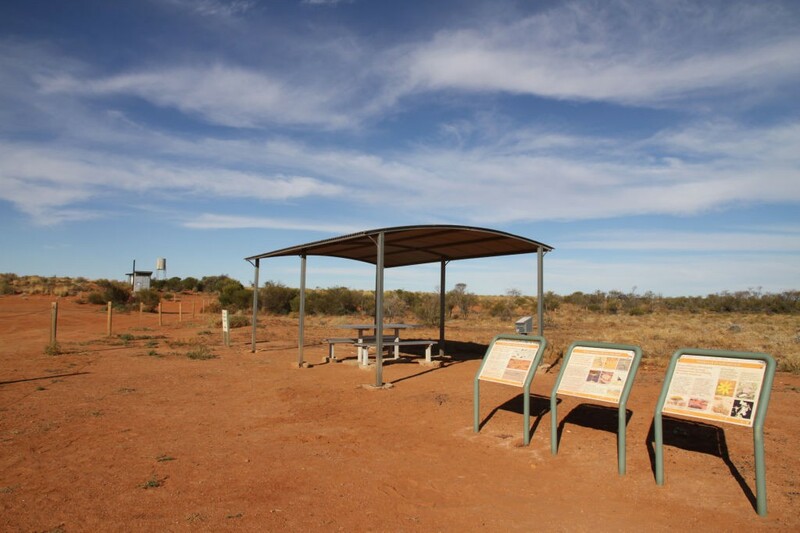 FOS members travelled to Purni Bore to assist with re-fencing; cleaning of the toilet and shower blocks; and the visitor shade shelter and information signs. FOS members travelled with Amanda to 3 O’clock Creek to maintain the watering system and weed around the existing trees. Several of the trees have died but it is hoped they will be replaced at next year’s working bee with trees currently being propagated in Adelaide. The group then travelled on to Federal to examine the damage to the Champagne bottles which were used as vegetable plot boundary indicators by the first settlers and then on to Bloods Creek to clean signage and replenish oil in the windmill. On several occasions members were invited to accompany the rangers to the boundary fence lines to deliver equipment and meet with management from neighbouring pastoral leases. The opportunity to visit the lush grasslands and water-holes showcased a new side of the park for members. On Tuesday 25th of May notification came through from DEWNR of the possibility of bad weather in the region which required the abandonment of the Co-Management Board meeting at Witjira scheduled for the coming Friday and therefore the cancellation of the Official Opening of the new Dalhousie Spring steps. 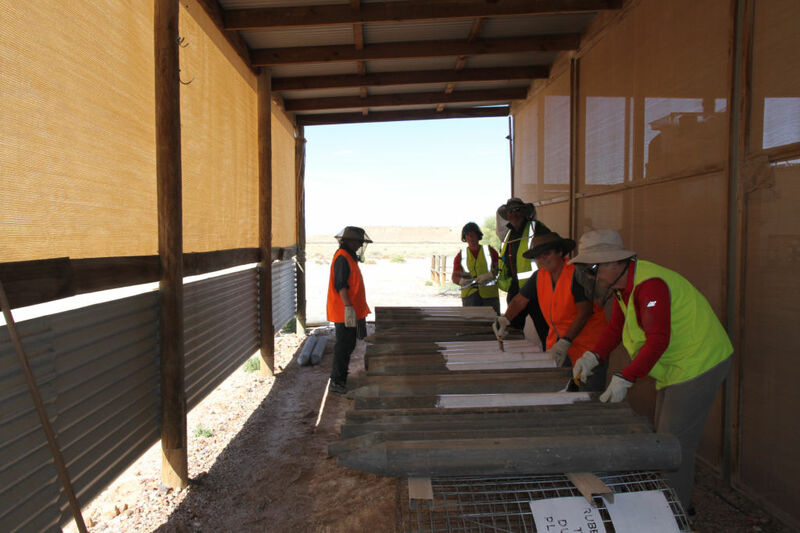 Work continues on Wednesday with everyone having a keen interest on the weather forecast and on Thursday morning Frank Lyman recommended everyone pack up and leave immediately as Coober Pedy was having heavy rain and it was heading for Witjira. All members agreed and left that morning and were able to travel safely from the region. As the Working Bee was abandoned several day’s early, some projects were unable to be completed. One very important task being the installation of a plaque attached to a significant rock acknowledging the cooperation of the Irrwanyere Aboriginal Corporation, the Department of Environment, Water and Natural Resources and the work of the Friends of the Simpson Desert. I am currently working with DEWNR on options to have the rock and plaque installed in Witjira National Park as soon as possible. 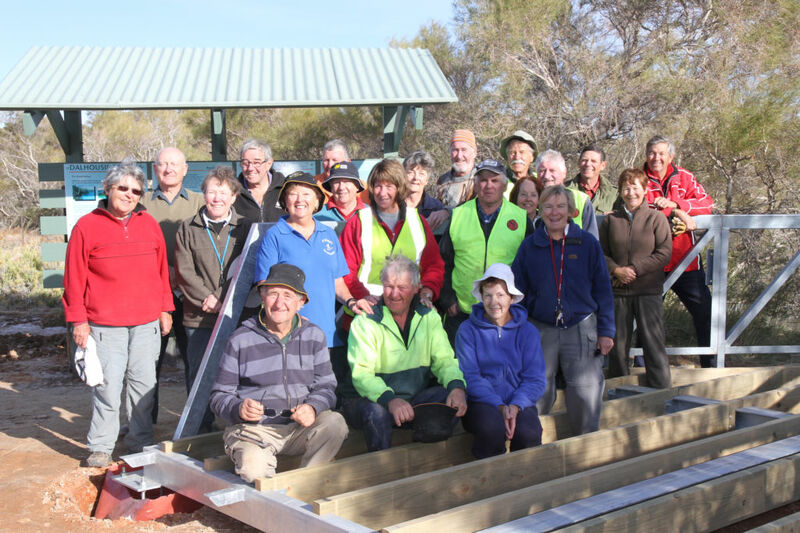 A big thank you to the 21 members who travelled to the 2015 Working Bee provided a total of 1334.5 hours of support to the rangers on site. It is also important to acknowledge the 352 hours of support provided by FOS members during the design and construction process in Adelaide. Projects carried over and possible future projects. Revisit and establish new photo points in the Simpson Desert. Investigate the feral cat population in the park. Ongoing maintenance to watering system. Develop new tap locations and planting of trees and plants. Continue discussions with Co-Management Board members regarding the proposed Warren Bonython walking trail at Dalhousie.